How to calculate calories from fat? While the word "fats" instantly makes us think about junk food and bad eating habits, the truth is that fats are actually critical to our existence. This daily fat intake calculator will help you estimate how much fats you should consume every day to maintain a healthy, balanced diet. Naturally, knowing how to calculate calories from fat doesn't necessarily mean that you are eating - and living - healthy. For a more comprehensive overview of a balanced diet, head straight to the macronutrients calculator. Fats, just like proteins and carbohydrates, are macronutrients - elements of food required for proper functioning of our organisms. Their main role is to give us energy: 1 gram of fats is equivalent to 9 calories, what makes them invaluable when food is scarce. For comparison, both proteins and carbs contain only 4 calories per gram. Apart from being an immediate source of energy, fats have a few more important functions. They are an energy reserve - if you happen to supply fewer calories than your TDEE (total daily energy expenditure), your organism will break up fat tissue for additional calories. The fats also help to regulate the water content of cells and provide essential fatty acids. Unfortunately, no golden rule dictates how much fats you should consume. Our daily fat intake calculator follows the most common guidelines, which say that your diet should consist of 20-35% fats. Naturally, this number is flexible; basing on your physical activity or health condition, you might find that a professional dietitian will recommend a different proportion in a personalized diet plan. Saturated fats. Your body can produce all saturated fatty acids it needs, so theoretically there's no need to include them in your diet. It is difficult to give them up, though, as they occur naturally in the same products as unsaturated fats. Still, we advise minimizing the consumption of some products with a substantial proportion of saturated fats. Such products include dairy fat (for example full-fat cheese), pizza, and palm oil. Trans fats. These are created during food processing and have a terrible impact on our health. Not only do they drastically increase our LDL cholesterol levels (the "bad" cholesterol), but also decrease the level of HDL ("good") cholesterol. Ideally, you should avoid consuming any trans fats. Some examples of products with trans fats are chips or crackers. Unsaturated fats. As opposed to the previous two groups, these fats have a positive influence on our health. They actually decrease our cholesterol levels when they replace the saturated and trans fats; to top it off, they can prevent some heart diseases. Sources of these fats include avocados, olives, nuts and peanut oil. 13 grams of fats contain 117 calories. 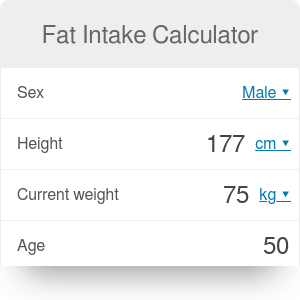 Fat Intake Calculator can be embedded on your website to enrich the content you wrote and make it easier for your visitors to understand your message.